To celebrate the London 2012 Olympics, Caithness are lending some real ‘weight’ to the occasion. This Scottish Paperweight company make the most extraordinary glass paperweights, and this one is no exception! 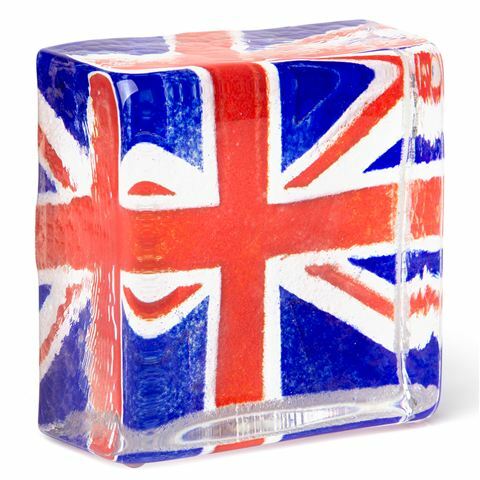 The hefty glass block features a sand cast union jack which resonates through the glass and results in a vibrant addition to any desk. The perfect way to celebrate the 30th Olympiad, this Union Jack Paperweight is a fine souvenir but also a timeless piece for Anglophiles the world over! Hand made in Scotland from glass. Four feet underneath the base protect your furniture from scratching. Commemorates the London 2012 Olympics. Dimensions: 10.5 x 10.5 x 4.5cm.